This example demonstrates how a Boolean OR function operates on two different layers. 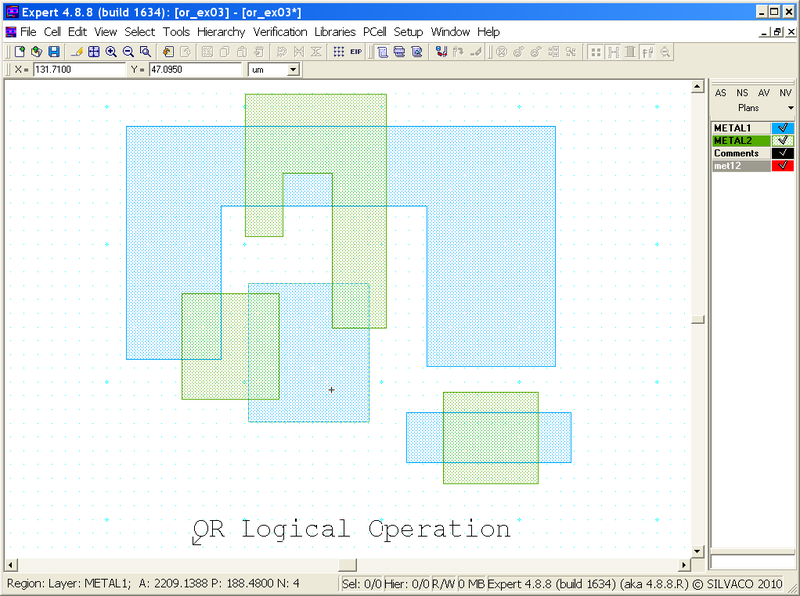 The OR logical operator is typically used in Guardian DRC or Guardian LVS to generate additional (derived) layers that will be used in other operations. In order to run this example, the user needs to open a Guardian DRC session and choose File->Open to load the project "or_ex03.eld". Then in the Open Cell(s) form that pops up, select "or_ex03" and select "OK". The cell "or_ex03" provided in the "or_ex03.eld" project is based on the OR illustration shown in Figure 2-15 of the Guardian User Manual. Figure 1 illustrates how to use the OR operator with two layers. The example combines shapes from the METAL1 and METAL2 layers to create a new layer called "met12". The "Copy" is not necessary, but is used to store the newly generated shape(s) into the layout in order see the results of the OR operation. Choose Verification->DRC->DRC Script panel . In the new window, choose File->Open... and select "or_ex03.dsf". 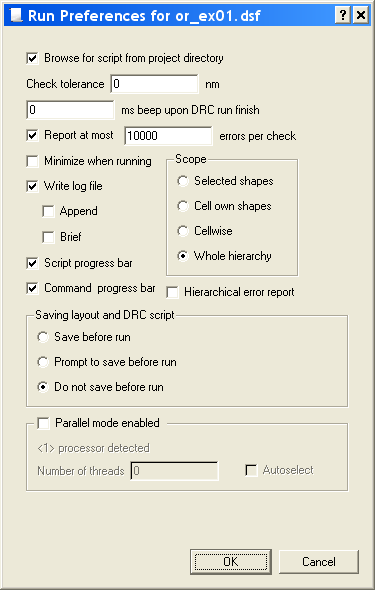 In the same window, choose Setup->Current DRC script run preferences... and set the options as shown in Figure 2. Accept the changes and press DRC->Run. To inspect the newly generated shape(s), make the "met12" layer active and then turn off all remaining layers using the "NV" button. (To make the "met12" layer active, click on the layer's color strip which contains the check mark). The original layout is shown in Figure 3. This example contains three shapes on METAL1 and METAL2 that intersect each other. Figure 4 shows the resulting shapes from the OR operation. Notice how the two layers were combined. The new shape(s) are a union of the two layers.